I'm a sucker for sword and sorcery flicks. Everything from Harryhausen's stop-motion Sinbad movies and Italian Hercules flicks to big budget Oscar bait like THE LORD OF THE RINGS. Even really low rent crap like DEATHSTALKER. And of course, perhaps the greatest example of the genre, John Milius' 1982 big screen version of Robert E. Howard's CONAN THE BARBARIAN, the movie that made Arnold Schwarzenegger a star. Despite my high regard for Milius' film, I was perfectly happy to see a new take on the character. Perhaps a version more faithful to the fast-paced, pulpy tone of Howard's original short stories. Or maybe one closer to the popular comic book incarnation of the Cimmerian warrior. Or even something that, like Milius' version, took the material and shaped it to fit the thematic interests of its director. Instead we get a movie that plays like a gorier version of TV's Hercules: The Legendary Journeys minus the humor and likable cast that made that show an enjoyable guilty pleasure. This new version begins with Conan's birth on the battlefield. His mother dies during after having Conan cut out of her stomach with a sword, but not before naming her child. 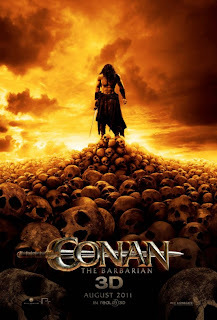 Conan is then raised by his father Corin (Ron Perlman, giving the only thing close to a memorable performance in the film). Morgan Freeman also drops by the recording studio to pick up a few bucks narrating some mumbo jumbo about a magic mask that gets broken into multiple pieces. Conan's father happens to have one of these pieces, which is why Khalar Zym (Stephen Lang) and his army of bad guys raid his village, killing most of the Conan's people in the process. Among the dead is Conan's father, and of course the young boy vows vengeance. Some years later, Conan grows up to become Jason Momoa. Conan has a few minor adventures with his pal Ukafa (Bob Sapp) during which he earns the loyalty of a thief named Ela-Shan (Saïd Taghmaoui) and picks up the trail of Khalar Zym and his daughter Marique (Rose McGowan). In order to get close to his sworn enemy, Conan must protect Tamara (Rachel Nichols), the last descendent of an ancient race of necromancers. In short, your typical bunch of nonsense for this sort of film, which is fine with me. The film's problems lie in other areas than plot. For starters, Momoa's portrayal of the character is considerably lighter and blander than Schwarzenegger's. The chances of this film doing for his career what the original did for Ah-nold are extremely slim. Lang and McGowan are serviceable villains, but certainly not on the level of James Earl Jones' Thulsa Doom. The 1982 CONAN was a film of few words, but when its characters spoke, what they said was memorable. If you have seen that film, then surely you remember Arnold telling you what was best in life, or telling his god Crom where he can go if he doesn't offer his assistance. There isn't a single line of dialogue in this film that matters or lingers. There is no philosophy, no vision, no substance. Some critics seem to think the problem with this CONAN is the amount of violence and gore. How can violence and gore possibly be a problem in a sword and sorcery movie? That's half the reason you watch something like this. But even on that level, this movie fails. The gore is all CGI, and there's nothing that looks more fake than CGI blood. The idea when you're making a fantasy film is to keep the audience in a state where they can suspend their disbelief. Once you draw attention to the man behind the curtain, you've lost. 2 out of 4 stars.